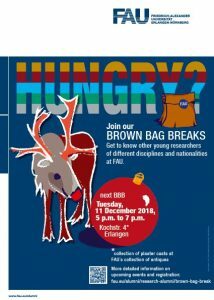 Forschungsförderung und Internationales | Brown Bag Break – Tue 11th December 2018, 5 p.m.
Brown Bag Break offers a great opportunity to get in touch with researchers from other countries and of different research background. The upcoming event, with the key topic „Development of an international research career – a humanities‘ perspective“, takes place at FAU´s Antique and Classical Collection of the Faculty of Humanities, Social Sciences, and Theology (Kochstr. 4, Erlangen).